Autumn is one of our favorite seasons! At Pauley’s Pups, we love seeing the leaves change color, the heat of summer cooling off and warm beverages. However, your canine companion may not be as excited for fall as you are. 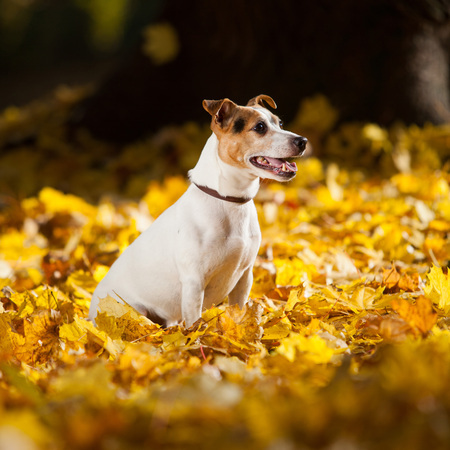 With smaller breeds, there are some precautions that you need to take to keep your dog safe during the changing seasons. We have compiled a list of some of the items you should address in the upcoming months. Poisonous plants start to become prevalent in the cooler months. Mushrooms, for example, can be highly poisonous and tend to bloom again when the summer sun and heat diminish. Since many types of mushrooms look alike, it can be difficult to distinguish which varieties are poisonous and which are benign. There are also conkers – the fruit of horse chestnut trees – which are toxic to dogs if ingested. Plus, if a canine swallows a conker whole, it could also cause a blockage, says Dogster. Cooler weather also means that many of us put antifreeze in our cars’ windshield washer solution. Be careful while doing this, though, to make sure that your antifreeze bottle is tightly sealed and cannot spill. Antifreeze can taste sweet and smell inviting to dogs, but if they ingest even a little bit, it can lead to a fatal situation. Symptoms of antifreeze ingestion include vomiting, diarrhea, lethargy, drooling, lack of coordination and excessive urination. Halloween can also be a scary time for dogs in the autumn months as well! There are all types of terrors on Oct. 31, and these costumes can be scary if your dog is not used to them. The constant doorbell ringing could frighten them, too, not to mention the possible dangers of Halloween candy. If your dog gets into Halloween candy – specifically chocolate – your dog may be in trouble. It is well known that chocolate is poisonous to dogs, so make sure all your tasty Halloween candy is out of reach. We recommend placing it on top of your refrigerator where there’s no change of your pup getting to it! When you take your dog on a walk in the fall, be conscious of your surroundings. Prior to hibernation, snakes often hide in wet piles of leaves. Because they’re preparing for a long nap, these creatures can be super cranky if disturbed by your pup on accident. Fleas and ticks are also prevalent in moist conditions before the winter freeze, so if you choose to walk your dog close to woods or a park, you could run the risk of your dog bringing home some unwelcome guests into your home. Keep up with your regular flea and tick treatments during the fall to make sure your dog doesn’t end up with an infestation of these pests. The changing of weather also brings cold temperatures, often a problem for smaller dogs. Smaller dogs are more sensitive to temperature changes, and the cold weather can make your pup shiver as they try to keep warm. We recommend putting your canine companion in a sweater and adding dog booties to make sure they stay warm. Moist weather can also cause your dog to catch a chill, but with proper clothing, your smaller friend will be comfortable and be able to face life head on! At Pauley’s Pups, smaller dogs are our specialty, and we know that the changing seasons can be overwhelming for your pup. Take a few proactive steps and be aware of these issues this fall to keep your four-legged friend safe and warm. To learn more about small dog breeds or our currently available puppies for sale, call us today at 804-798-7877.